No afternoon with Mickey Fulp would be complete if you didn’t discuss politics and philosophy. I used Mickey’s 2016 speech at the Morality and Capitalism conference, available here, as a spring board for some broad conversation around his beliefs. I even made a little gif of part of the talk, which you can find here. In case you hear something that is new to you, consider trying the ‘World’s Smallest Political Quiz’ that Mickey mentioned. Your own results may surprise you. You can find a recording of the conversation below here. Enjoy! P: To close out, if you want to talk briefly about the Morality and Capitalism video that has been released there. P: Just trying to dig into what exactly -- there's a whole list of different fallacies and logical errors that people can make. 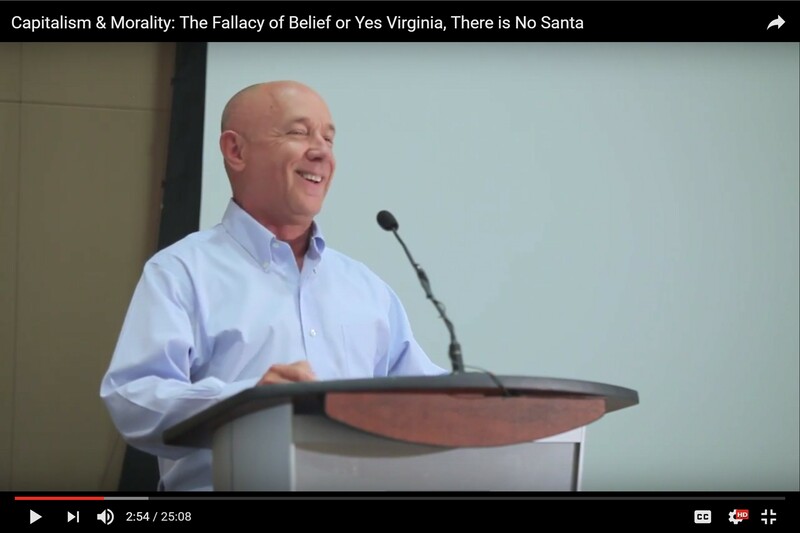 I wonder what you meant by 'the fallacy of belief'? M: Well, I have no faith. I hate the word and, you know, Mark Twain said faith is believing what you know ain't so and that says it all to me. I said that Mark Twain was my favourite author. The guy was genius. M: It's all about science and reason for me. I don’t use the word. I refuse to use the word 'belief'. You can't see it, touch it, smell it, hear it, that's belief -- if I can't do those five things with my senses, my brain, logic, and reason then I just don't -- I'm not a believer! Simple as that, I don’t know how else to say it. Haven't been a believer for a long time. P: I wonder how much that may have influenced some of your life choices and path along the way? M: (laughs) Well, I've had an interesting life. I have taken some risks in my life. You ask me -- how do I want to die? -- and I said, doing something which makes me happy. I love to pound rocks and fish and hunt. You know, one of those things. P: Not a lot of belief required in any of those activities. M: Life is a death sentence. P: Yeah, it is a 'terminal illness'. M: If you approach your life like that, then you're probably going to live a more productive, in-the-moment life. When you're not concerned about some illogical idea that you can be immortal. P: Do you try to shake up the people out there? You know, you're out there making these statements in a public venue -- the videos on youtube -- do you hope to reach people who may not necessary believe or feel the same way? M: No, absolutely not. I don’t really care. You know, I'm a 'live and let live' guy. That goes back to 'do not tread on me and I will not tread on you' . M: I find it counter-productive to argue religion with religious people. It's just not something that is part of my life. I'm not on a platform to convince people -- when you look at it, I was probably the only person at that seminar who stood up, talked, sat down, and there were no questions. I didn’t expect there to be questions -- I was just stating my platform. Kind of like a manifesto. I will be glad to discuss it, but -- you know. M: I just reject dogma. And doctrine. The basis of it is that I have a very high disdain for authority -- always have. Someone tells me I can't do something or I'm not supposed to do something, maybe I ought to challenge that. As long as I don’t harm them. This is all about the non-aggression policy. P: I wonder to what degree you are inspired or encouraged by the potential for this stuff to live on, in some way. Given the modern digital age and the potential for information like this to be present in the future in a way that it may not have been in the past. M: Well, this whole libertarian movement has not been -- you can say that Murray Rothbard invented it. It has it's roots in the Founding Fathers and the constitution, but this movement is gaining rapidly. Look at Gary Johnston, who was the Governor of New Mexico from 1992 to 2000 maybe. And now, all of a sudden, he's gonna get at least 10% of the vote. Last poll I saw he's at 25% in New Mexico. He's pretty much a libertarian and a free thinker. Hopefully our movement gains traction. M: If you really take a look at most Americans -- I don’t know if you’ve seen the 'World's Simplest Political Quiz'? I first saw it on John Stossel, who is pretty much a libertarian guy. Give that test to most Americans and a significant number fall in the libertarian range. They just don’t quite realize it. It's a matter of talking about it. We're gaining traction and I find that encouraging. P: The potential to open up access to information and divergent views. M: Certainly, the internet has changed our lives. I couldn’t write and be on top of so many topics if I didn’t have the ability to go research whatever I need on the internet. Changing the world. And that's good. P: Well, I appreciate you taking the time here today to make some new content and put it out there. Who knows who will read it long into the future. M: Yeah, that's kind of exciting -- isn't it? -- shy of destroying ourselves with nuclear war, this stuff is going to be around for a long time and that's nice. Think about in the day, we have Socrates, Aristotle, Archimedes, Newton, and nobody has ever heard those guys speak. What we have is probably remnants of what they wrote. Da Vinci -- there's one -- design a helicopter sometime in the sixteenth century. All good! P: Well, thank you very much. I'll let you go here. M: Thanks for your time. I look forward to whatever you gleam out of this. We talked quite a lot -- good luck with transcription of even parts of this. P: Yes, I did a call with a company recently and it was an eight-thousand word transcript! M: Well, wouldn’t surprise me if I've spoken way more than that today. P: My favourite part was that I think I had about five hundred words in the thing. M: Well, your questions have been great. I can tell you did a lot of prep on that and I really appreciate the time you have devoted to some of my writings, to delve into it and ask me questions. Thanks for your underlying research, Peter. P: You're welcome. All the best. M: You too. Thanks, bye. Again, you can find a recording of the conversation here. It was my pleasure to spend this time with Mickey. I learned a lot about him and his approach to the business, and hope you can benefit from our interviews. Best wishes for the future, Mickey.